Shirley Louise (Stauber) Moeller, 88, of Sturgeon Bay died peacefully after a courageous battle with dementia at Bornemann’s Senior Communities in Green Bay. Shirley was born in Sturgeon Bay, the daughter of the late Alex and Irene Stauber. Growing up, she attended Stokes School, a one-room school house, until eighth grade. Shirley graduated from St. Joseph’s Academy in Green Bay in 1948. On May 29, 1954, Shirley married William (Bill) Moeller at Holy Name of Mary Catholic Church in Maplewood. Shirley’s professional career began at the Door County Register of Deeds and later transferred to the Door County Treasurer’s Office, where she served as deputy county treasurer for more than 40 years before she retired to spend time with her husband and family. 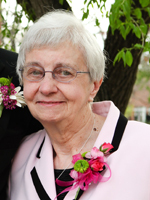 Shirley was a longtime, active member of St. Joseph’s Catholic Church in Sturgeon Bay, where she served in numerous capacities. She was a member of Christian Women and Catholic Daughters of America, for which she served as treasurer for many years. She was also a member of the Sturgeon Bay Business Women’s Club. Shirley was an incredibly strong woman: never complaining and looking out for others, especially those in her family. She was a natural caregiver and will always be admired by her family for her loyal, caring and unfailing spirit. She enjoyed cooking and gardening, and she especially loved spending time with family, friends and relatives. Attending her grandchildren’s events and activities brought Shirley so much joy. She also loved traveling and taking bus tours with her late husband, Bill. They enjoyed their time in Washington, D.C.; New York; and Nashville. Shirley is survived by son Bob (Beth) Moeller, De Pere; three grandchildren, Jeremy (Ann) Moeller, Green Bay, Angie Moeller, De Pere, and Chad (Vanessa) Moeller, Peoria, Arizona; two great-grandchildren, Nathaniel and Lillian; nieces and nephews, Chuck Johnson, Andy Johnson, Dave Tollefson, Debbie Burk, Bill Lawrie, Randy Lawrie, Heather Lawrie-Smith, Meredyth Nelson; plus many cousins. She was preceded in death by her husband, Bill, in 2003; her parents; and numerous brothers-in-law and sisters-in-law. A Mass of Christian Burial will be held at 11 am on Tuesday, April 23, at St. Joseph’s Catholic Church in Sturgeon Bay. Entombment will follow at the Shrine of the Good Shepherd Mausoleum in Green Bay. Visitation will be 4-7 pm on Monday, April 22, at Forbes Funeral Home in Sturgeon Bay and again at 10 am Tuesday at church until the time of the mass. A prayer service is scheduled for 7 pm Tuesday at the funeral home.